Let me tell you a little bit about this new Epic Bar. The Venison is sourced from grass fed deer. One bar is 80 calories, with a whopping 12 grams of protein, 0 grams of sugar, and an amazing 25% daily value of calcium and 10% iron. This is such a great bar if you are trying to make your macros without eating those crappy, synthetic bars you find on the market. I tried this bar after I got back from vacation in San Diego. I had a super indulgent long weekend--too much drinking with the girls and Paleo deviations. Yea. I had a cupcake. A real one. But because I hadn't been fueling my body as I normally do with lots of nutrient dense food, I felt kind of tired and cranky to be back at work. After I had this bar for a snack, I immediately felt a burst of energy! Yep. That's what quality-sourced food will do for you, right? And I'm not even being paid to write this, folks. Now for the flavor. I really enjoyed it. It's just right. Meaty. Seasoned well, but not too much. Flavor-packed, not too gamey, not too dry. It might just be replacing the Chicken Sriracha flavor as my favorite Epic Bar. 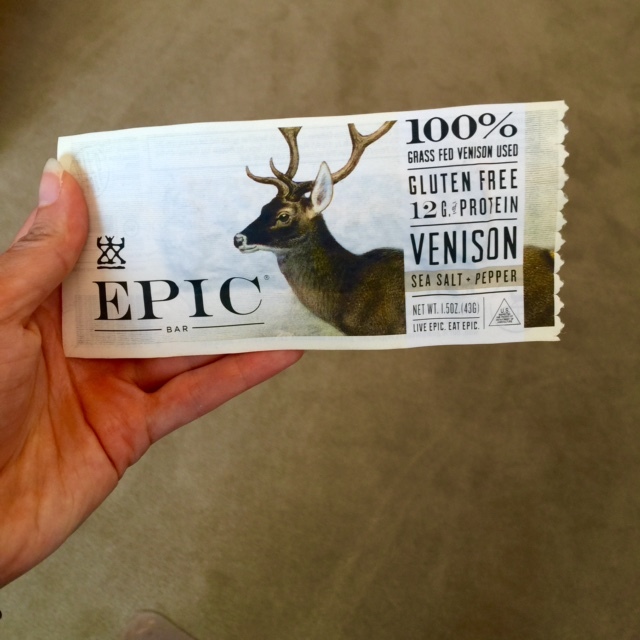 So if you weren't sure--I definitely recommend this Epic Bar flavor.